Skrill originated back in 2001, and is an e-commerce business that allows fast and simple payments to be made online. The company first launched in the UK under the brand name Moneybookers, and they rebranded as the Skrill Group in 2010. The way that Skrill works is super simple and convenient, and it’s an extremely popular payment choice with online bingo players across the UK. All you need to access a Skrill account is an email address and a password, and once you’ve then signed up you can use Skrill for many different forms of online payments across the web. It works like a sort of online wallet, or e-wallet as they are known, and you can use the online account to both spend and receive money via the internet. You just top up the account as and when you need, and you can use it for personal payments between family and friends, betting and several recommended online bingo sites ,international payments and also business use too. It’s a great way to keep on top of all your online payments in one place, and recently this has been made even easier with the introduction of the Skrill mobile app. 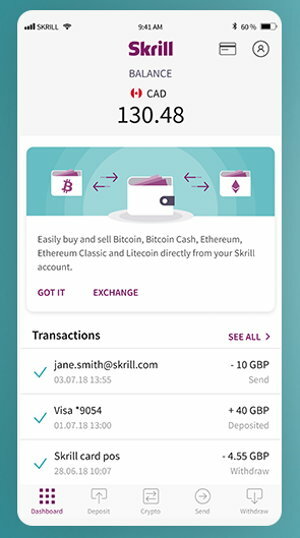 Skrill are one of the world’s largest digital wallet providers alongside the likes of Neteller and Paypal, and they have millions of both personal and business account holders across the globe. Therefore if you do decide to choose Skrill for payment to any online bingo sites, you can have full faith in the knowledge that you will be banking with a safe, trusted and secure online payment system. There are a flexible range of payment options available to fund your account, and there is now also a 1-Tap service available for instant, frictionless payments in just 1 click. Payments via Skrill are nearly always instant, allowing you to purchase items or deposit into your account straight away and start using the funds. Because using Skrill doesn’t require customers to send any credit or debit card details to the end merchant, it is considered a safer method of depositing and withdrawing online. Skrill has been making digital payments simple, secure and quick since 2001. The company started out in the UK to begin with, but have since gone on to become a truly global brand. They are now a market leader in online payment solutions, and have become a hugely popular choice with online bingo players in particular. In 2001, Moneybookers was founded. The idea of the company was to create a one stop payment solution for online use, that was quick and secure for both personal and business accounts. The company really started making waves in 2002, and became Europe’s first FCA regulated e-money issuer. Over the next 8 years, the Investicorp Technology Partners completed the buyout of the original Moneybookers company, and the new and rebranded Skrill was then officially launched. In 2009 the company linked up with eBay, and Skrill were then ranked as the UK’s fastest growing private equity backed company in the Sunday Times Deloitte League Buyout Track 100 Table. The company then continued to grow and evolve over time, and introduced the Skrill mobile app, 1-Tap payments system and also acquired the Paysafecard by 2014. 2001 – Moneybookers was founded. 2002 – The launch of Moneybookers is the first step towards helping consumers send money online with just an email and a password. The company become Europe’s first FCA regulated e-money issuer. 2007 – Investicorp Technology Partners completes the buyout of Moneybookers. 2009 – The company link up with eBay. 2010 – The company is rebranded as the Skrill Group, and they are ranked as the UK’s fastest growing private equity backed company in the Sunday Times Deloitte League Buyout Track 100 Table. 2011 – Skrill adds Pay by Invoice and Pay by Instalments to its product range after Payolution becomes part of the Skrill Group. 2012 – Skrill 1-Tap is launched. 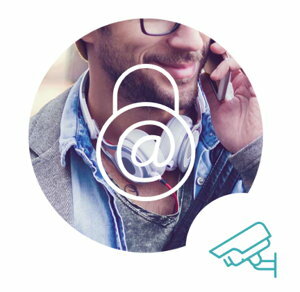 2013 – Skrill acquires the Paysafecard. 2014 – Skrill acquires Ukash to extend the scale and reach of Paysafecard. 2018 – Today Skrill is trusted by millions across the world. Skrill currently have over 36 million customers worldwide, and allow payments across 200 countries using 40 different currencies. Skrill continues to grow day by day, and the company is still going from strength to strength. Using a Skrill e-wallet for online bingo is really simple and extremely quick and efficient. Once you’ve signed up for your own personal Skrill account, you simply link those details up to your preferred online bingo sites and all will be set up and good to go. Once registered for Skrill by choosing an email address and a password, you can transfer money into your Skrill account to use online however you may need. A huge selection of online bingo sites accept Skrill as a payment method these days, so just choose this option whenever funding or withdrawing from your online bingo banking account. Sign up to Skrill with an email address and a password. Fund your Skrill account via credit or debit card or another means of payment. Sign up/login to your preferred online bingo site. Select Skrill as the payment option to fund your online bingo account. Enter you Skrill account details into the online bingo site. Withdrawals are processed in a much similar fashion when using Skrill. Simply input the amount that you wish to withdraw, and then choose Skrill as the method that you wish to complete the transaction. If you aren’t logged in to your personal Skrill account already, the online bingo site will require you to enter your email and password before confirming the withdrawal request. Although using a Skrill account to play online bingo is fairly simple, it’s worth noting that there are certain fees that can apply when using Skrill in general. Using your e-wallet to pay at any online bingo site that accepts Skrill is totally free. Receiving money into your online Skrill account is also free too. This means that when you play games using your Skrill account and receive any winnings via that method, you generally shouldn’t incur any additional charges. You will incur charges however when uploading funds to your Skrill account via a bank account or credit card, or also if exchange rates/bank charges apply etc. The charges are generally always quite small, however they can differ depending on which payment methods you use/whichever banking provider you are with. Below is a guideline on the kinds of charges to expect when using Skrill. This information is always subject to change however, so it’s best to check all terms and conditions with both Skrill and your local banking provider upon registration. It is worth noting that certain credit cards may also charge additional costs too depending on the service provider/type of card you use, and these charges will be out of Skrills control and Skrill receive no part of those funds. There will be a 3.99% currency conversion fee should you spend internationally. Another fee that can occur is if you do not login or make a transaction for 12 months. As of March 2019, 5.00 EUR (or equivalent) will be deducted monthly from the funds in your account. There is an option to use the Skrill CRYPTOCURRENCY service, and this will incur fees ranging from 1.5% to 3.00% depending on the currency used. All of the above figures are always subject to change, and you will always be informed by Skrill of the charges that you may incur. An online Skrill account is fairly diverse as a payment method for online bingo platforms, and there shouldn’t be any major restrictions with its use. However depending on the type of Skrill account that you have, certain additional terms and conditions may apply from time to time. You will be sent a full breakdown of your account upon registration, and it will outline any restrictions you may come across such as upload/withdrawal limits and transaction limits etc. Cryptocurrency terms may differ between account holders. Skrill VIP programme allows more use of your account. Skrill money transfer and rapid transfer terms may differ from person to person. A Skrill e-wallet isn’t just a simpler way to pay online these days, it also adds another layer of protection to your personal financial information too. The secure and well established payments system makes paying, playing and shopping online easy and safe. As you only need to enter an email and a password when using your Skrill account online, your card or bank details are never revealed. Any information you enter is encrypted to the highest standards of the Payment Card Industry Data Security Standards ( PCI-DSS level 1) therefore your data is unreadable even if someone tries to intercept it. Skrill also offer the Two Factor Authentication Application (2FA). This means that you can set up an extra layer of security on your account, by entering a code from your phone along with your email and password. It’s important to always look out for ‘phishing’ emails too online, and you should always be aware that Skrill will never contact you asking for any passwords or payment details via email or phone. It’s easy to see why many online bingo players choose Skrill as a form of payment for their gaming. Although there are very small charges that can occur from time to time, it’s still a very safe, secure and popular way to fund and withdraw from an online bingo account. The company have been established for over 18 years. Skrill is known, trusted and used throughout 200 countries across the world in 40 different currencies. A Skrill account is super easy to use, and it makes internet payments fast and quick with instant transactions. The Skrill app allows users to fund and withdraw from their online bingo accounts really easily, and you can keep track of all payments in the palm of your hand. Having a Skrill account allows users to spend and transfer money across several other platforms/shops across the world too. Fees may occur when funding and withdrawing from your Skrill account, however these are kept pretty minimal and you will be made aware of all charges upon registration. The 1-Tap Skrill feature allows instant payments. The customer service team are always readily available should you encounter any issues when using Skrill. A huge amount of online bingo sites now accept Skrill as a payment option. Hundreds of businesses throughout the world use and accept Skrill. There is an option to use the Skrill Cryptocurrency feature should you wish. You will never need to enter any personal card or payment details online when using Skrill. Skrill is a great way to both fund and withdraw from your online bingo account. As soon as you get your head around the simple registration process and the fees and charges that may occur, you can literally start playing online bingo with just 1-Tap straight away.